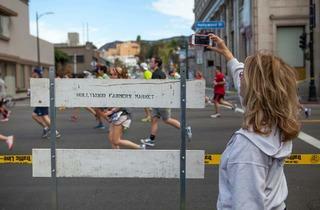 The LA Marathon is a 26.2-mile scenic course with plenty of landmarks for photo opps and meeting up with your runner. Even if you're just out to watch 25,000 athletes run through your city, some places are better than others to watch the race. 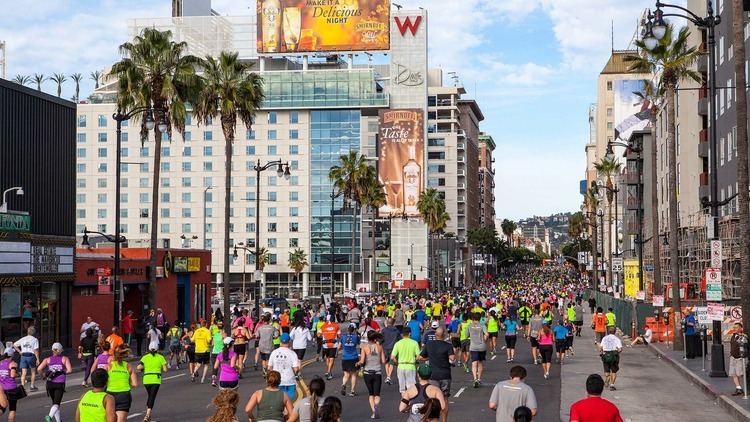 Here's our list of Instagram-worthy locations for watching the LA Marathon (and here's the course map for reference and also detailed street closure information), Also, before you go, make sure you read our essential tips for spotting your runner during the race. 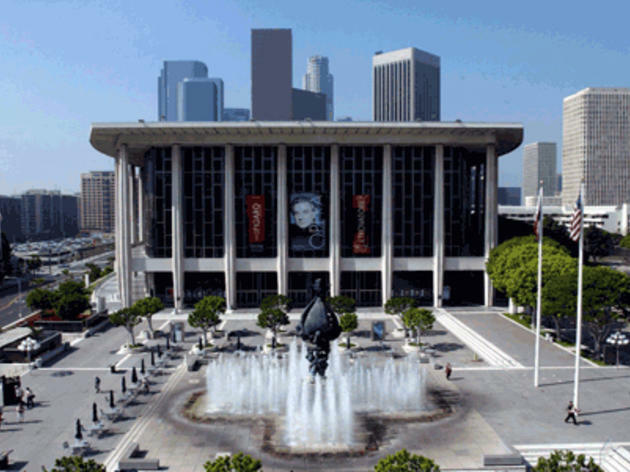 Just past the mile 4 marker, Dorothy Chandler Pavilion is one of the earliest places in the LA Marathon to look for your runner. The crowd of runners will still be pretty heavy, so if you do plan to meet a friend there, just make sure they know to look for you. How to get there: Get off the 110 at 4th Street (check this list of freeway ramp closures) and park wherever you can. Roads will likely be blocked to traffic as you approach 2nd Street. 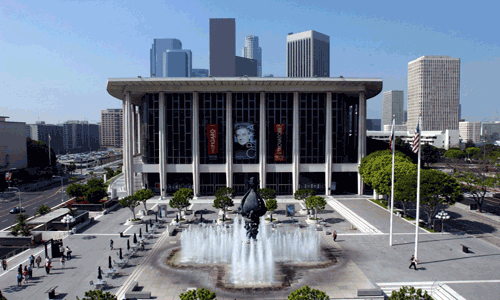 If you take Metro, get off the Red Line at the Civic Center/Grand Park stop and walk up to Grand Avenue. 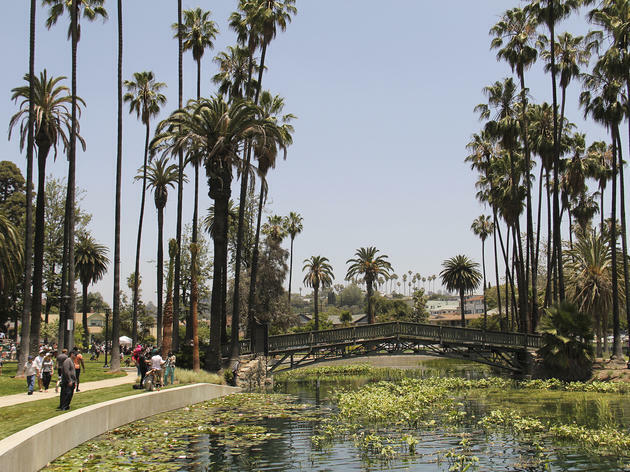 The LA Marathon course hits mile 6 along Echo Park Lake. It's a long, straight stretch of road, so it's a decent place to hang out and cheer others on while you look for your runner. That being said, try to be specific about where your runner should start looking for you when he or she reaches the lake. It will be easiest if you stand right near the Mile 6 marker sign, or the 10K timing pads (6.2-mile marker) a little past that. Once you've seen your runner, head over to Square One at the Boathouse for a coffee. 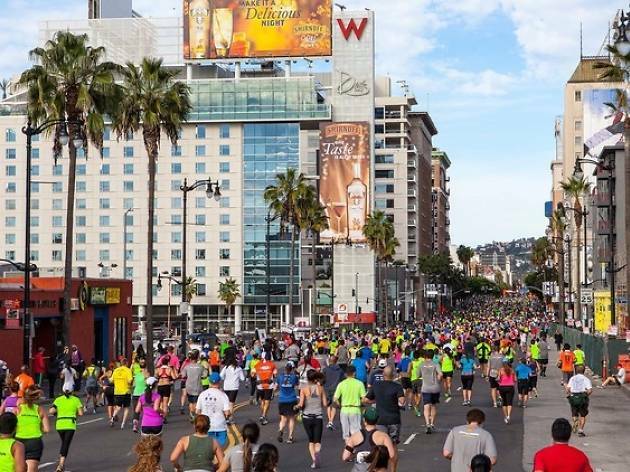 How to get there: Much of the LA Marathon course is on Sunset Boulevard, so you won't be able to take Sunset to get to the lake. 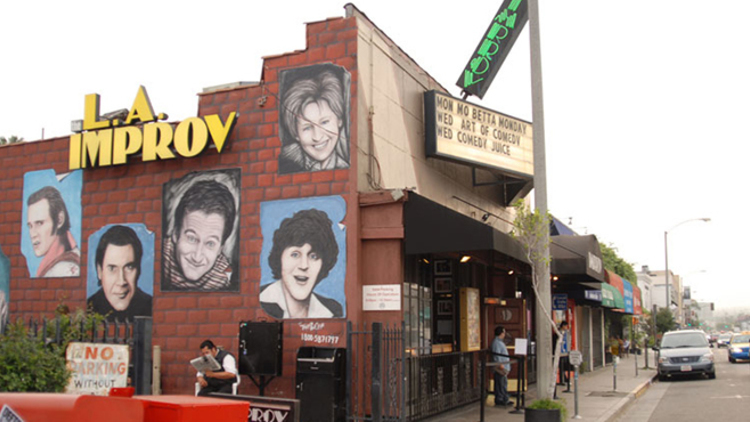 If you're coming from the south, take Alvarado or if you're coming from north of Sunset, take Echo Park Avenue. Find parking in the neighborhoods. 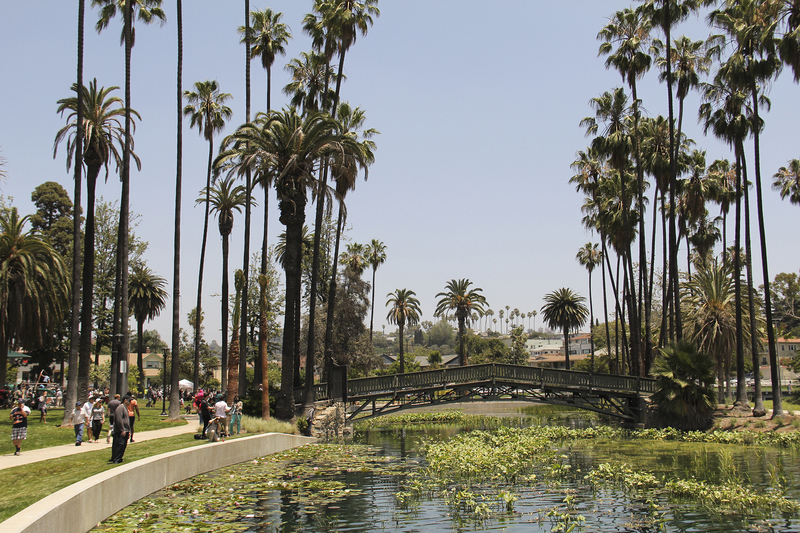 After Echo Park Lake, runners continue along Sunset Boulevard to where it bends and becomes Hollywood Boulevard. 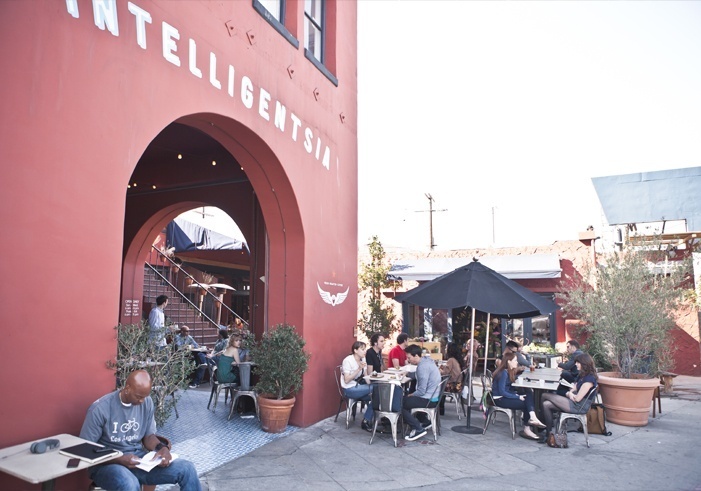 It's basically a two-mile stretch between mile markers 7 and 9 that are full of sidewalk cafes and coffeeshops that are ideal for spectating. 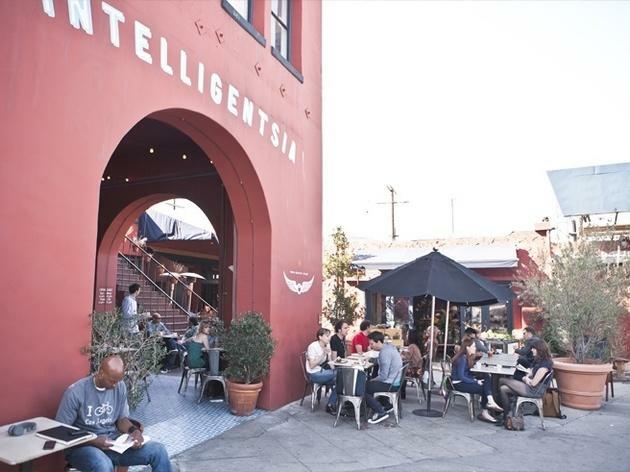 Intelligentsia, Caffe Vita, Café Stella, The Black Cat and Home State are just a few options. 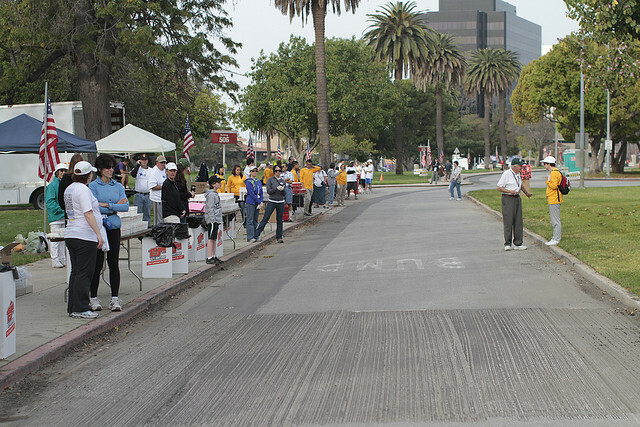 Whatever you do, just don't taunt the runners with whiffs of your pancakes, bacon and coffee. They've got about 16 miles to go before they get to breakfast. How to get there: Either take the Red Line to Vermont/Sunset and walk east along Sunset, or get off the 101 (but check this list of freeway ramp closures) and drive east. Your best bet, whether you're coming from the west or the east, is to park in the neighborhoods. 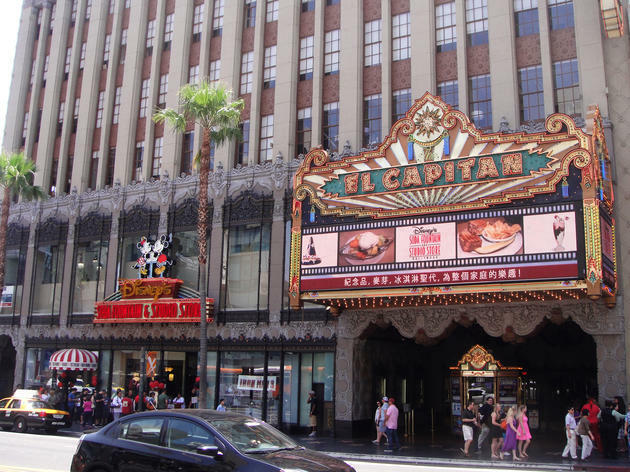 El Capitan, The Egyptian and the TCL Chinese Theatre are all great options. These are all past the mile 11 marker, so the crowd of runners will have thinned out by this point, making it a little easier for you to spot your runner. 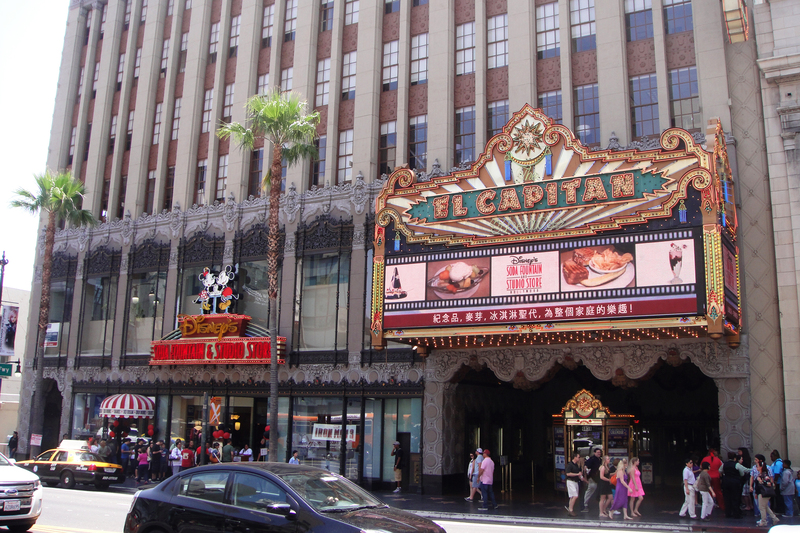 Just specify which side of Hollywood Boulevard you'll be on ahead of time. How to get there: Either take the Red Line to the Hollywood/Vine or Hollywood/Highland stop, or get off the 101 near the Hollywood Bowl and drive down Highland to the mall parking lot. 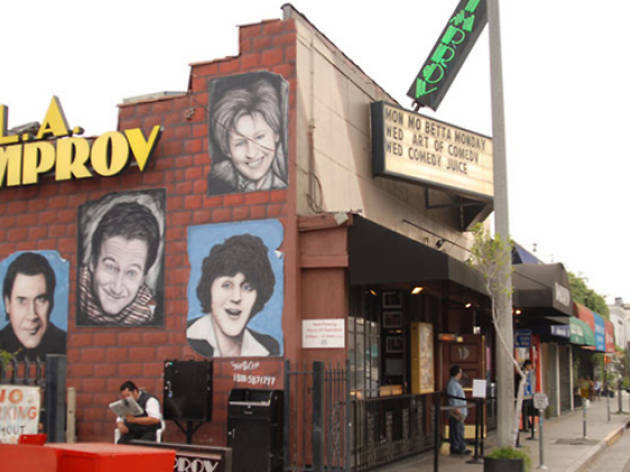 You could also get off the 101 past Sunset, park in the neighborhoods, and walk up to Hollywood Boulevard. 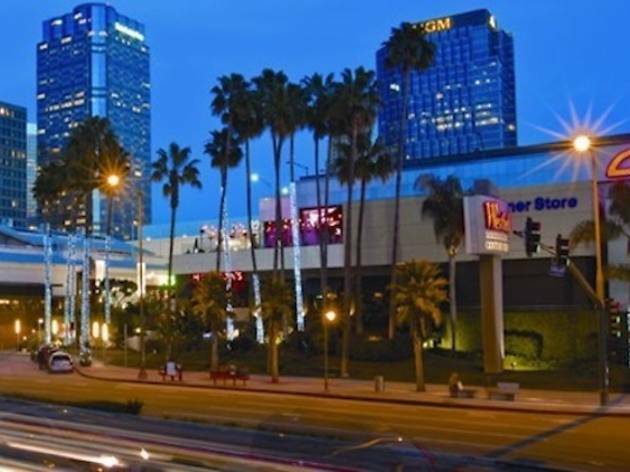 With so many landmarks, the Sunset Strip has plenty of photo opps for spectating—the House of Blues, the Sunset Plaza Hotel—but it's not the easiest for parking. If you live within walking distance, go for it. The halfway point (13.1 miles in, to be exact) falls on the Strip near Crescent Heights Boulevard, so there will be plenty of celebrating going on there. How to get there: Park in the neighborhoods south of the Strip (unless you live north of it, of course) or even park on Santa Monica Blvd and hoof it up the hills to Sunset. 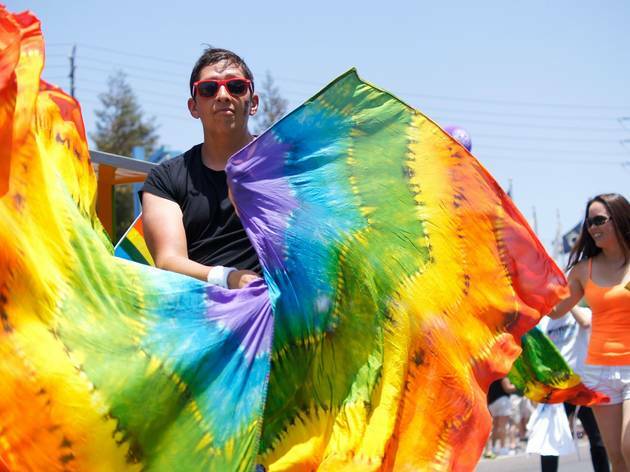 If you're looking for a party atmosphere and you can't make it all the way to the finish line in Santa Monica, you've got to be a cheerleader in West Hollywood. 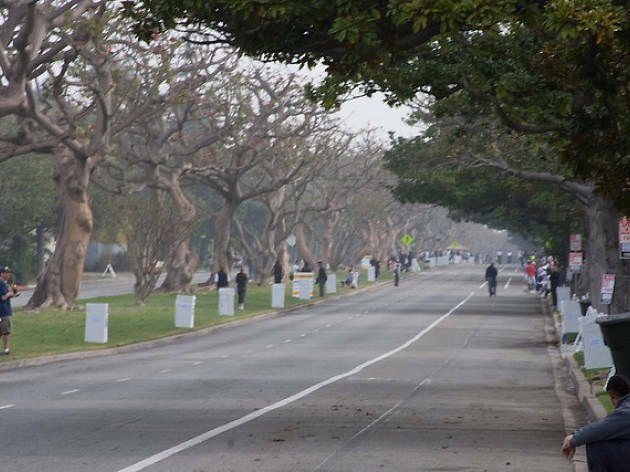 The race course passes briefly through the heart of "historic Boys Town" on Santa Monica Boulevard between San Vicente and Doheny, and this part of town knows how to do parades. A marathon is kind of like a parade, right? Choose to watch from hot spots like Rage, St. Felix, or the Abbey and get ready to party. The energy there is critical for runners who are 15 miles in with 11 more to go, and entertaining for spectators. 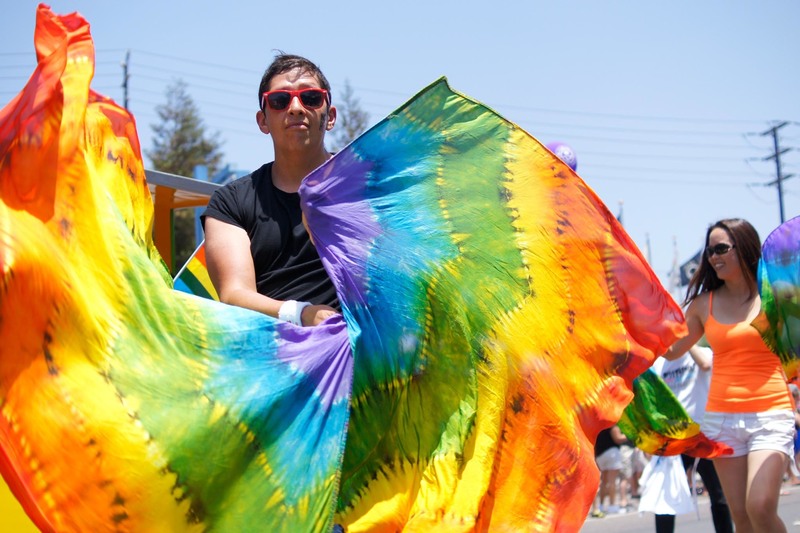 How to get there: Park at the lots near the West Hollywood library, or anywhere along Melrose, and walk up to Santa Monica Blvd. 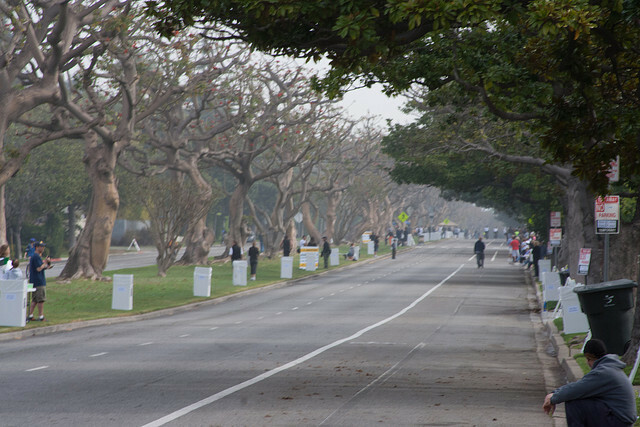 This stretch of the LA Marathon course is by no means the most scenic, but it's a segment that's great for spectators and, well, soul-crushing for runners. This is where runners are hitting miles 19 and 20, and they are exhausted. So, for spectators, it's a moving display of willpower and strength and drama. For runners, seeing spectators there (especially ones who are cheering) is a huge and neccessary boost. It's also a wide, straight stretch of the course, so it's easy to give individual encouragement to runners and spot a friend who might be running. 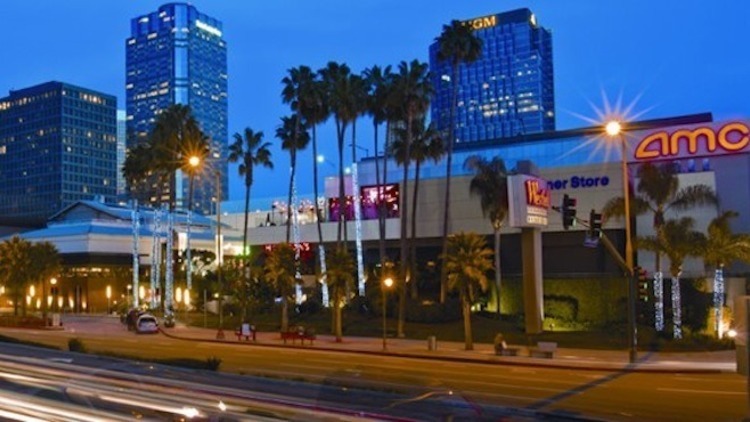 How to get there: Park at Westfield Century City and cross to the north side of Santa Monica Boulevard, or if you're coming from above Santa Monica Boulevard, park in the neighborhood south of Wilshire and walk down to the course. It will take some dedication to get to the Veterans Administration campus with the road closures, but it's a great place to watch the race because spectators make a difference here. Every year, this stretch of the course is silent as the grave. All you can hear is the rhythmic pounding of feet and groans of pain (not kidding). If you want to boost some spirits, get yourself to the VA.
How to get there: There will be some walking involved, but don't complain—it won't take you 20 miles to get there like the runners you're watching. Either park east of the freeway and walk under the freeway at Ohio Avenue (runners use this too, so you'll be on the course but it's usually not a problem) and follow the runners until you find a spot that needs some cheering. Or, park west of the 405 in Brentwood and follow the course from San Vicente backwards into the VA. Alternatively, park in the neighborhood south of the VA and walk up into it. Wherever you park, you'll be following the marathon course itself. You might not be able to tell from the look on runners' faces, but the finish line party starts once the course turns onto San Vicente. It's basically the home stretch of the marathon, and it's all downhill until the last flat stretch of Ocean Avenue into the finish line chute. San Vicente is a wide street with a grassy median and there are usually spectators cheering there and on the sidewalk. 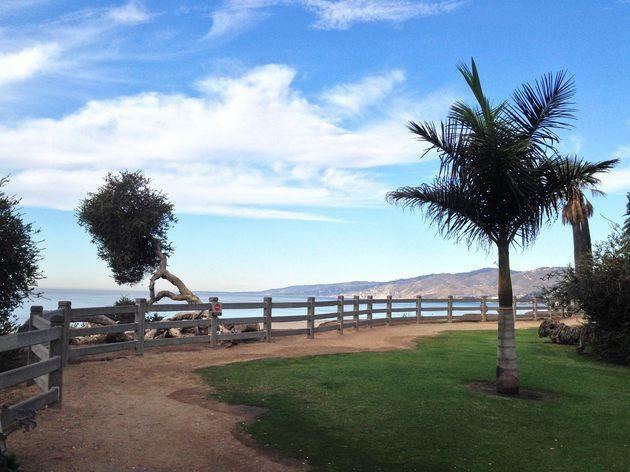 If you're looking to meet up with a runner at the finish line, it's a great spot to give them a boost through the last couple of miles before heading to Santa Monica to meet up once they're done. How to get there: If you live west of the 405, San Vicente will be easy to get to for spectating, especially if you can walk. If you arrive early enough, you can park near the finish line (if you're giving a friend who's running the marathon a ride home, he or she will thank you for the quick walk to the car) and walk up to San Vicente. You can also take pretty much any Big Blue Bus to get close (the 3M along Montana is probably your best option: just get off at your desired cross street and walk up to San Vicente). This is it! This is the end of the course! And it is a zoo of spectators and sweaty, exhausted and possibly delirious runners. If you want to cheer at Palisades Park, get there early. 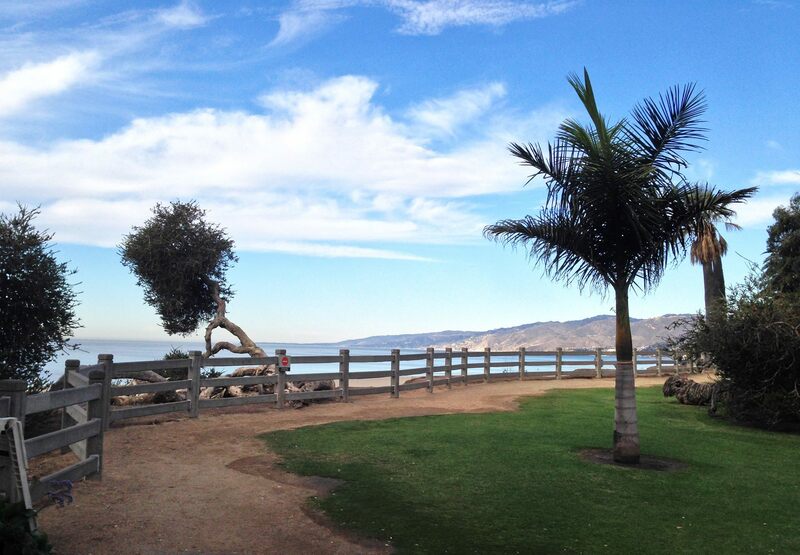 Stay to the northern end close to where Ocean Avenue meets San Vicente. That curve in the road is a fantastic place to spectate—you will have a front row seat for when the runners catch their first glimpse of the finish line. Bring tissues and your loudest cheering voice. How to get there: Parking will be a complete mess in the downtown Santa Monica structures—in fact, all the prepaid spots the city sets aside for spectators are sold out. Either get there really early, or take the Big Blue Bus or a Metro bus as close to Ocean Ave as you can get. 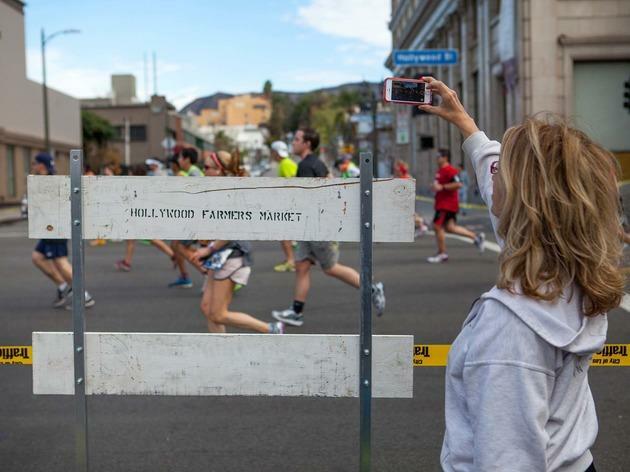 Looking to find and cheer on a specific LA Marathon runner?